The Malverne Jewish Center is truly an amazing place … To be a rabbi, to be a congregant, to be a part of what we do. This was extremely evident during these High Holy Days … the turnout for Rosh Hashanah and Yom Kippur surpassed my hopes, both for current members, former members and members hopefully-to be. The ruach, “spirit” during services was wonderful, with great participation and support. None of this would have been possible without a huge amount of support from many people who made sure things went smoothly. Herb, Carl and Dave assigned honors, made sure people were where they needed to be and when, and included as many of our guests as possible in services; something I know they truly appreciated. Ruth Hyman, the chair of our Religious committee, has been terrific in letting me bounce some of my more “unorthodox” ideas off of her, and I appreciate her wisdom and input. Herb, with help from Carl and my husband David, put up the beautiful sukkah on my patio, and the beautiful weather on the first day of Sukkot allowed us to enjoy our annual lunch under its canopy. Todah rabbah to Pat Sachs who arranged the beautiful food and was flexible to accommodate my last minute request to eat outside. Linda and Suzi handled set-up and clean-up, allowing Pat to enjoy the luncheon with her sons and MJC friends. Arlene Lynn helped me decorate the sukkah as well, and brought guests to our luncheon. The coming month of Heshvan is often referred to as mar Heshvan, meaning “bitter Heshvan,” because there are no festivals during this month. There’s another reason, having to do with Jepthah’s daughter, but that’s a discussion for another time. At MJC, it’s not a bitter month at all! We have a lot of “sweet” activities planned, beginning with a talk by Jessica Steinberg, daughter of Rabbi Theodore (z”l) and Dorothy. We’re thrilled that she’ll be coming to MJC. We’re also beginning a program called, “What Are We Saying When We’re Praying?” that will explore certain sections of our liturgy to hopefully make them more interesting and accessible, and to understand what they’re all about. I’m doing my best to make sure that people in the area know that the Malverne Jewish Center is alive and kicking, and now I’m asking for your help in this as well. 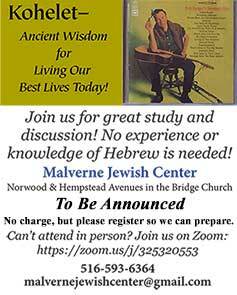 As Dave Feldman said on Yom Kippur, MJC needs you. Sure, we’d love to see more people coming to services on Shabbat morning and festivals, but participation goes way beyond services. Our lovely kiddushes and refreshments for programs don’t come out of thin air, and I know there are plenty of people with great ideas for programs and activities. Please speak up! I realize that in many organizations it feels as though the person who comes up with an idea ends up having to run the project, and yes, that may happen, but the more people who get involved, the more support there will be. Yes, everyone is busy, but I can’t stress enough hat MJC belongs to all of us. Attending activities is wonderful, I hope you’ll take the next steps … if you’re not already inviting friends, please start. If you are, thank you. I hope you are having a sweet start to the new year!